Transcription of an article titled ‘The “Coo-ees” to Parade’ in The Farmer and Settler, 7 March, 1916, p. 3. 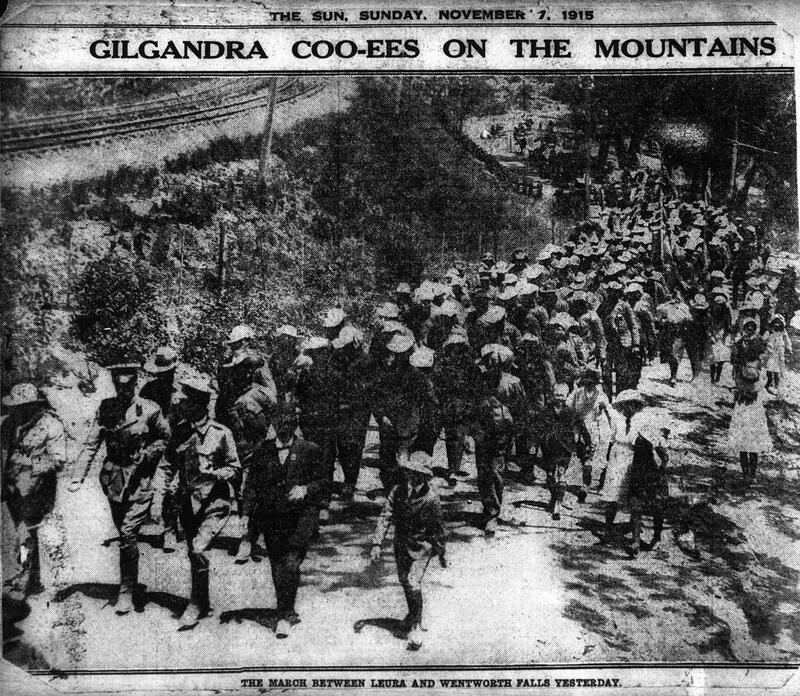 The Gilgandra “Coo-ees,” who made history last year by marching “from the sunset to the sea,” have nearly finished their period of training at Liverpool, and will soon be on the troopship en route for the seat of war. Some have already sailed as a part of the 14th reinforcements for the 13th Battalion, some are in the Light Horse, and in the Artillery, others, again, have entered the non-coms. school ; but the bulk of the original “Coo-ees” are still in the infantry. 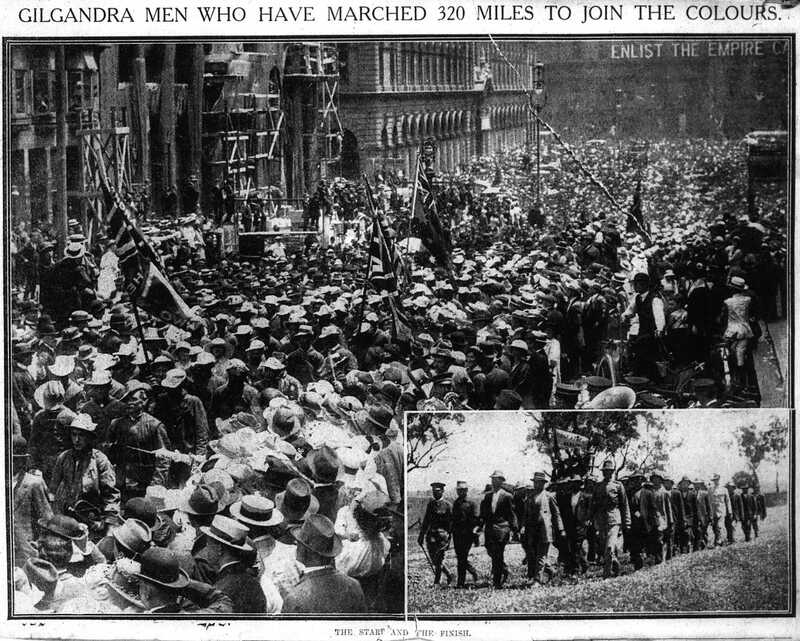 Of the 270 men that marched in to Liverpool camp, 220 are still with the force — a good percentage. 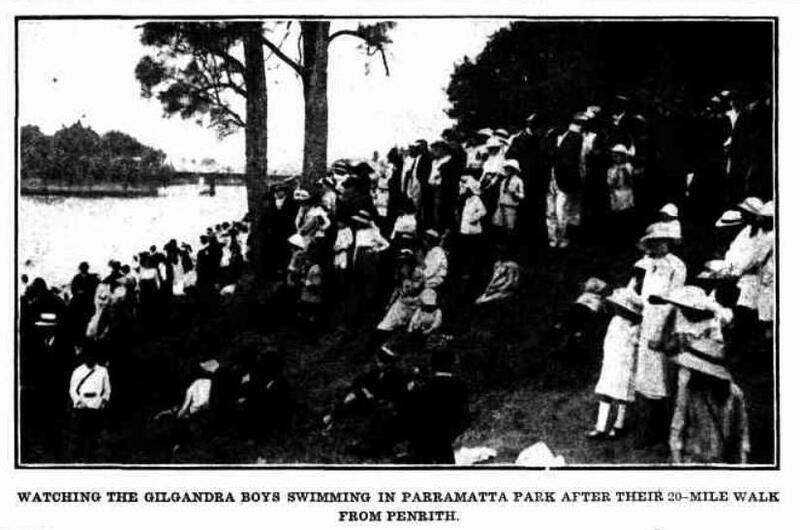 Transcription of an article titled ‘Reinforcements’ in The Sydney Morning Herald, 8 March, 1916, p. 13. INSPECTED BY THE STATE GOVERNOR. The heavy rain of the morning made it appear as if the inspection of reinforcements arranged for yesterday afternoon would not take place, and that the men would be merely marched from the Central Railway Station to the Royal Agricultural Show Ground, and for this contingency all arrangements had been made by Headquarters’ Staff. By midday, however, the sun came out; the black clouds disappeared, and when the men arrived from Liverpool the sky was brilliantly blue, flecked here and there only by masses of white cloud. 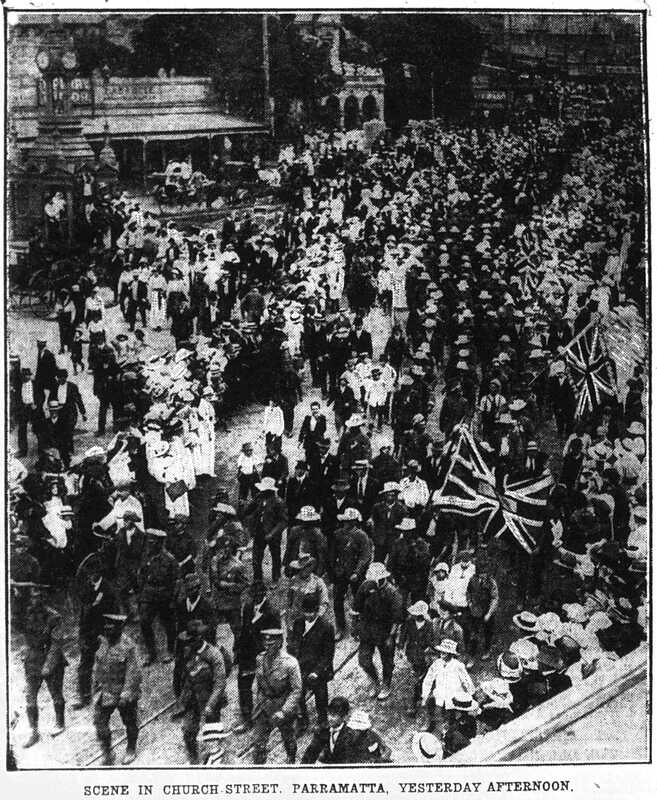 To music supplied by the Liverpool Depot Band and the Casula Band, the reinforcements marched from the railway station, via Eddy-avenue, Elizabeth-street, Wentworth-avenue, and College-street to the outer Domain, entering by the St. Mary’s gates. By the time the troops had assembled there was a large concourse of people to welcome them, and the parade ground presented an animated spectacle with the long, unbroken lines of khaki in tho centre, and the variegated colours of the ladies’ dresses, banked up on the four sides of the square. Shortly before 4 o’clock the various reinforcements arrived, and took up their positions, with their flags fluttering in the breeze, and the bands playing martial airs. Military and civil police kept the square free of spectators, and as the hour for the inspection struck, Brigadier-General Ramaciotti, accompanied by his orderly officer, Lieut. Frank Smith, of the 13th Battalion, Major Sadler (General Staff Officer), and Captain Stokes (of the General Staff) arrived at the ground, and were ac- corded the general salute. 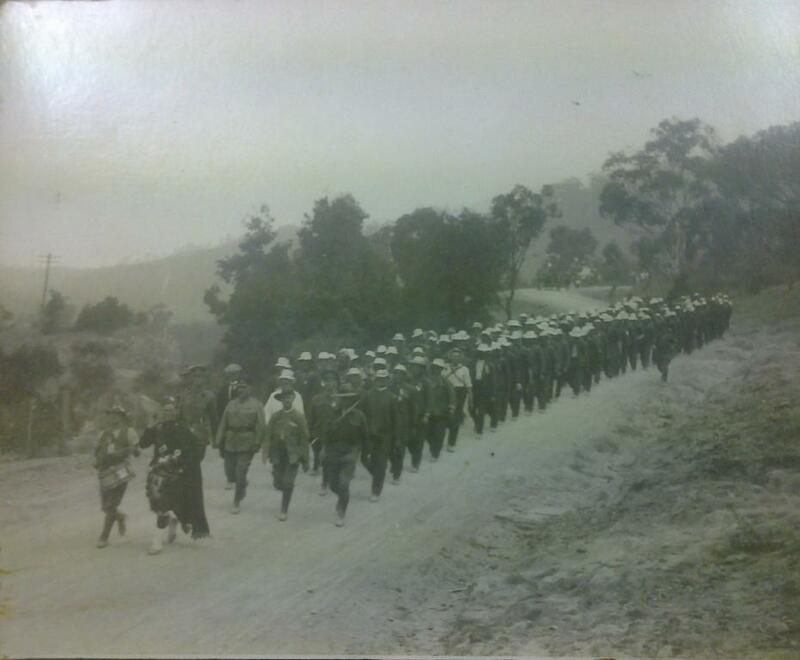 Tho Commandant made an inspection of all ranks, which included the 15th Reinforcements of the 1st Battalion; reinforcements for the 2nd, 3rd, 13th, 17th, and l8th Battalions; 2nd Divisional Train; 1st and 2nd Light Horse Brigade Trains; 7th Australian Army Service Corps; 1st Light Horse Field Ambulance; 5th and 8th Field Ambulance; the 1st and 2nd Reinforcements of the Mobile Veterinary Sections, and the 2nd Australian Remount Units, comprising the 5th, 6th, 7th, and 8th squadrons. Major C. V. Watson was in command of the whole parade, and the men stretched in a deep, unbroken line from the path in front of Richmond-terrace to the eastern side of the parade ground. As the general salute was sounded and the Commandant, accompanied by his staff, set out on his tour of inspection, the sight was an inspiring one. 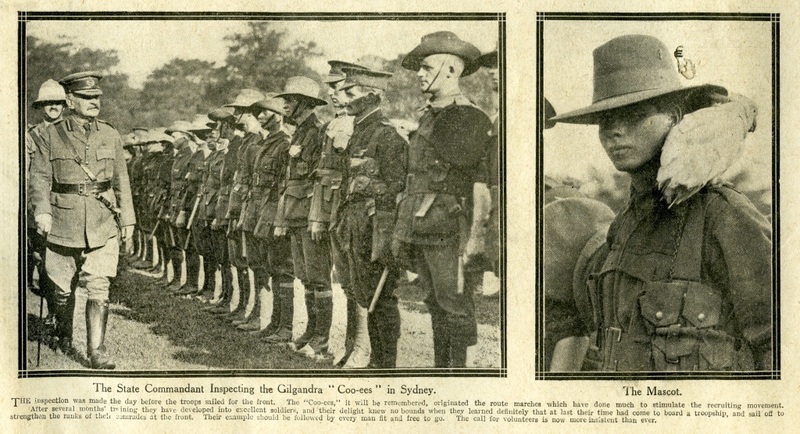 Under a typical Australian sky the men stood rank on rank, making a fine showing, and the brilliant costumes of the ladies only made a fitting setting for the sombre khaki, backed as they were by the foliage of a hundred dark green shade trees. On the conclusion of his inspection the general returned to the saluting base, and was joined by his Excellency Sir Gerald Strickland, the Governor, and his A.D.C., Captain Firth. This was the moment for the march-past, and the various reinforcements swung along with their regimental colours in quick time. Major Watson, having passed the base, wheeled, and joined his Excellency and General Ramaciotti at the saluting base, and watched the men whom he has trained swing by. They were a fine level lot, hard as nails, and brown as the proverbial berry, and looked fit enough to give a good account of themselves against any enemy on whom they might be flung. 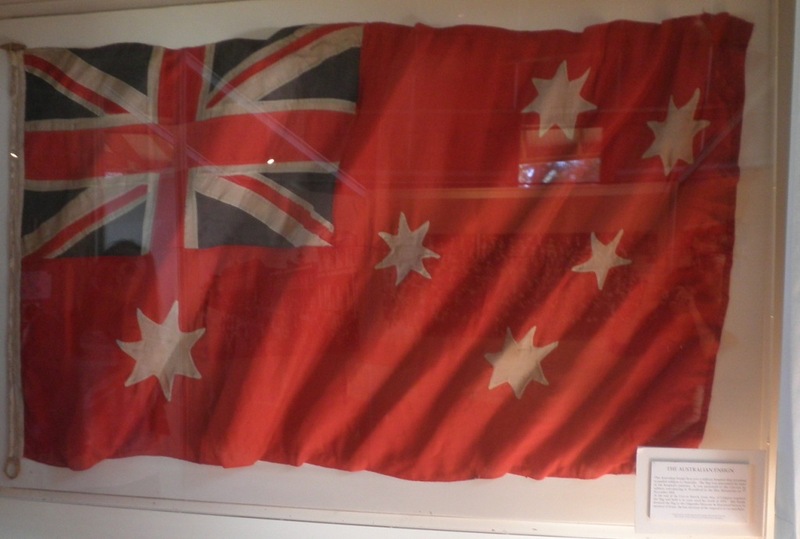 Conspicuous among the colours carried was that of the 15th Reinforcements of the 1st Battalion, recently presented to the men by Miss Dorothy Brunton. 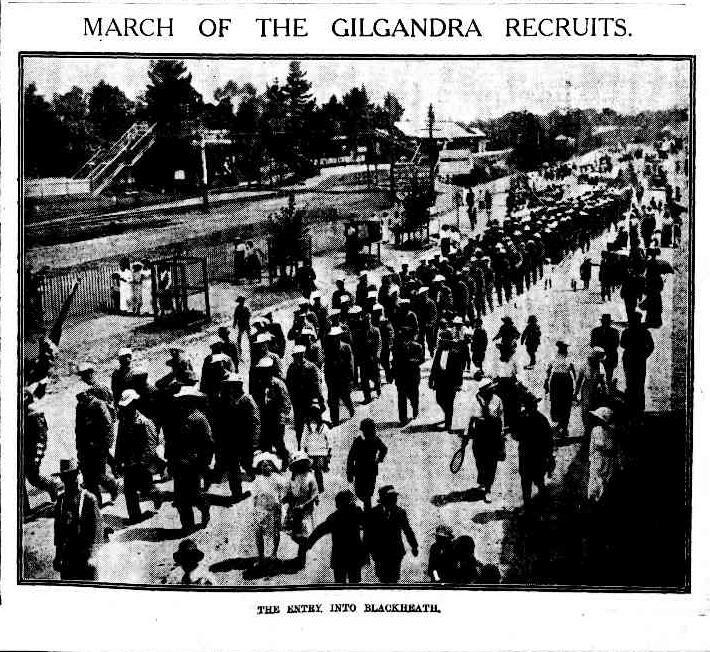 At the conclusion of the march-past, Brigadier-General Ramaciotti stated that his Excellency was very pleased with the showing of the men, and the fine way in which they had marched past. 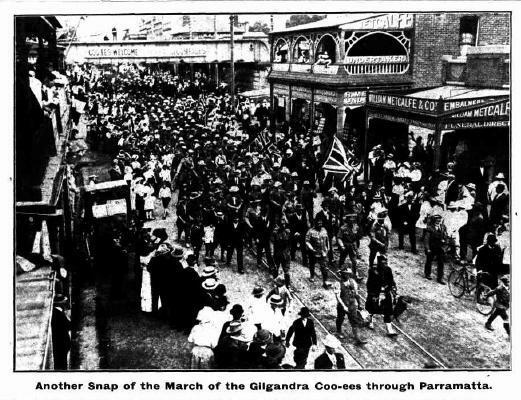 Photograph and caption with heading ‘The State Commandant inspecting the Gilgandra “Coo-ees” in Sydney’ in The Sydney Mail, 15 March 1916, p. 8. 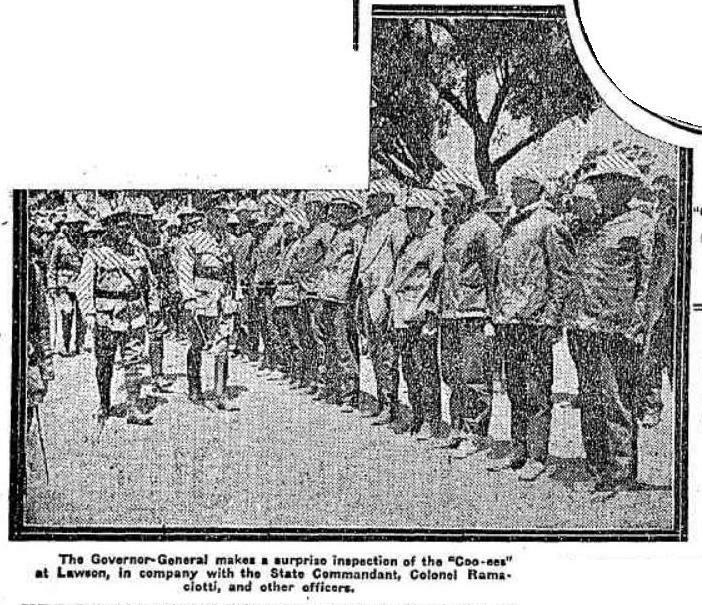 ‘The State Commandant Inspecting the Gilgandra “Coo-ees” in Sydney. The inspection was made the day before the troops sailed for the front. The “Coo-ees,” it will be remembered, originated the route marches which have done much to stimulate the recruiting movement.